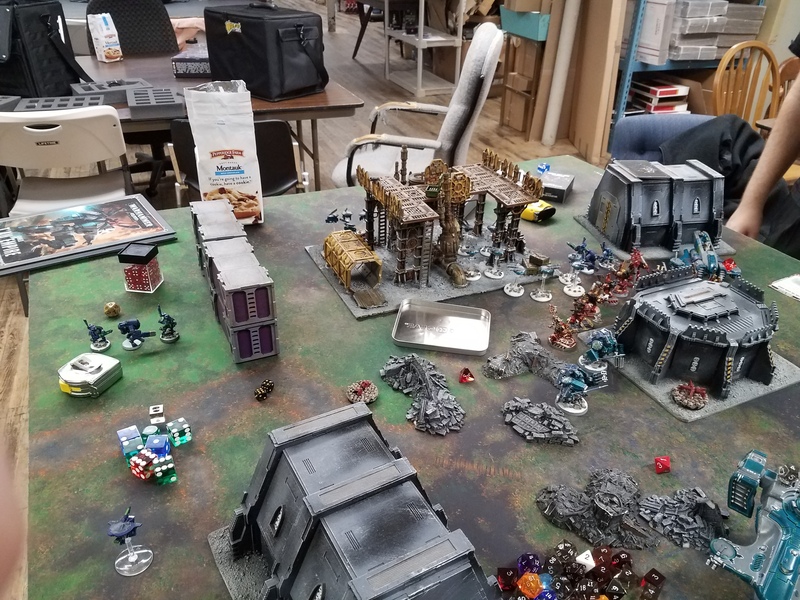 So I played a 3000 point game against spencers world eaters with my Tau. 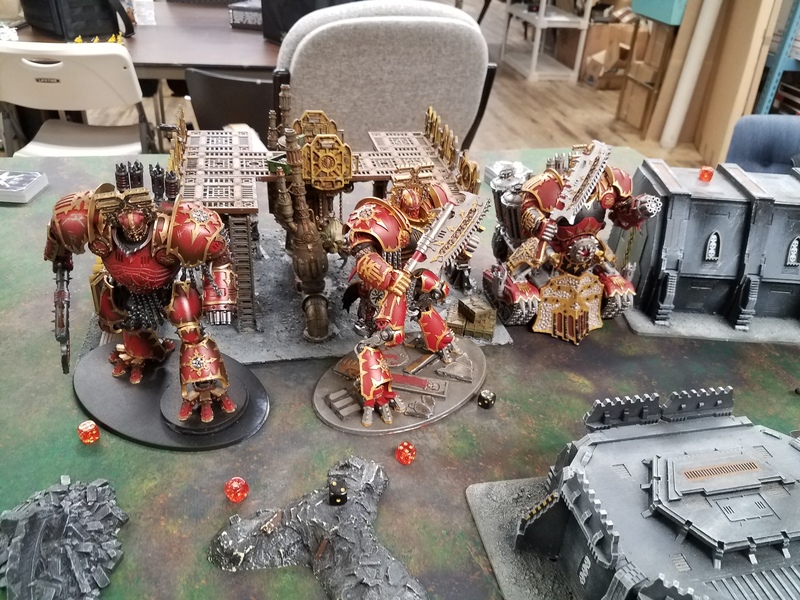 Spencer said he was going to bring 3 lords of war and I said I was going to bring some big guns. 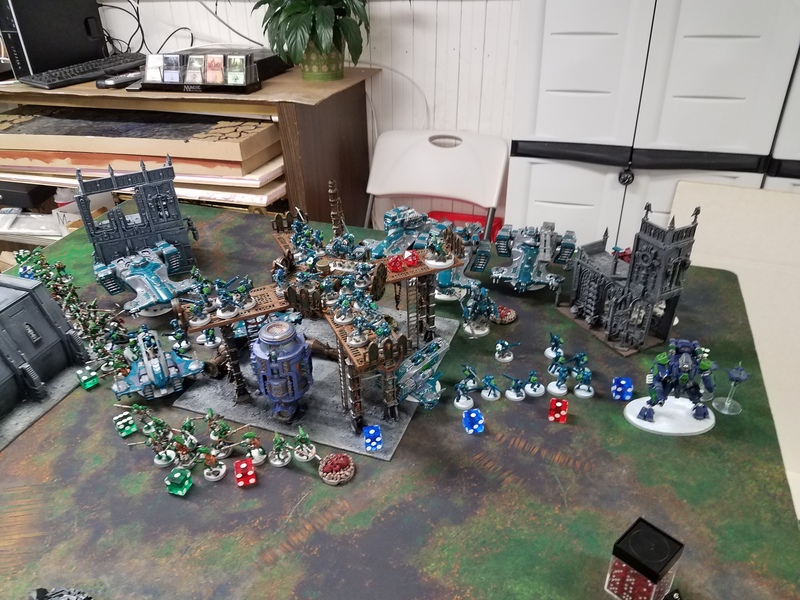 It's actually the largest game I've ever played of 40k so it was pretty neat for me and I snapped a bunch of pictures. 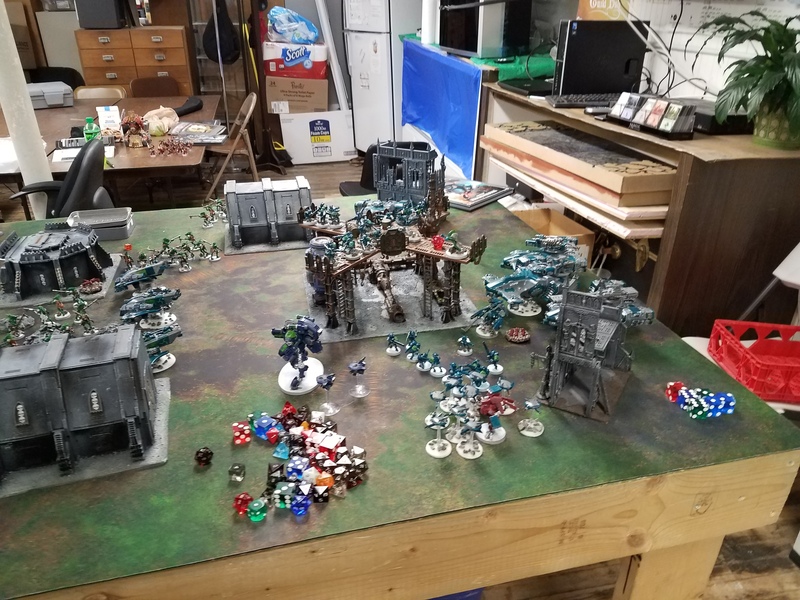 We ran a random maelstrom chapter approved mission and got the one that gives the standard victory points, points for the 3 cards you have each turn and one for each kill point. Due to the massive discrepancy in kill points we said lords of war were worth 3. Vanguard - (Sac'ea Sept) - I messed up while writing this I realized I forgot to add a second HQ to make this a battalion as I had initially intended. 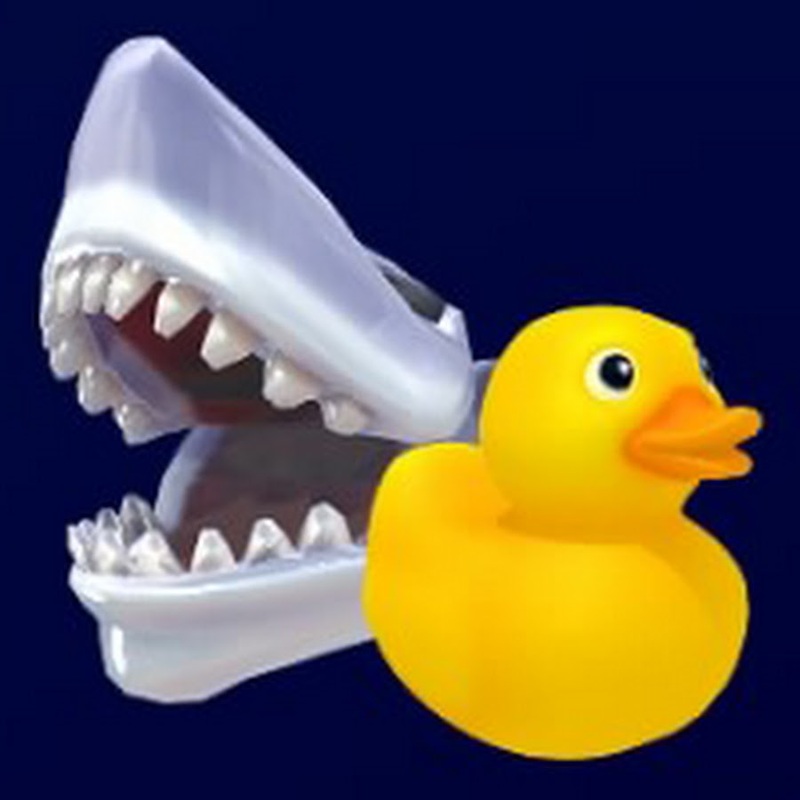 My skyray was proxied as the devilfish because I wanted to try it out. I think their initial volley of 6 seeker missiles with +1 to hit vs fly is pretty good when the game is often decided T1/T2. Tau have a hard time generating that number of d6 damage shots in one round. My general game plan was to drop my Sa'cea aoe markerlight and T'au +1 to wound roll stratagems each turn. It should allow me to mark up to two important units and have even my fire warriors be effective against any target wounding marines on 2's or lords of war on 4's. I think his plan was to take out my tanks with his lords of wars guns and introduce me to the business end of his axes. So the world eaters lined right up on the front. We had the v 9" in from the center. I had most of my forces back to deny a first turn charge which would have ended me if spencer got first turn. My kroot lined up on the V as far forward as possible or on my right flank. The plan was to pull back if I didn't get first turn or move forward to get in the way if I did get first turn. My cold 2 cold star commanders witht he burst cannons and the drones were in deep strike reserves. I put my stealth suits in my opponents corners which was another mistake on my part that didn't have an impact. I won the roll off and Spencer failed to seize initiative. 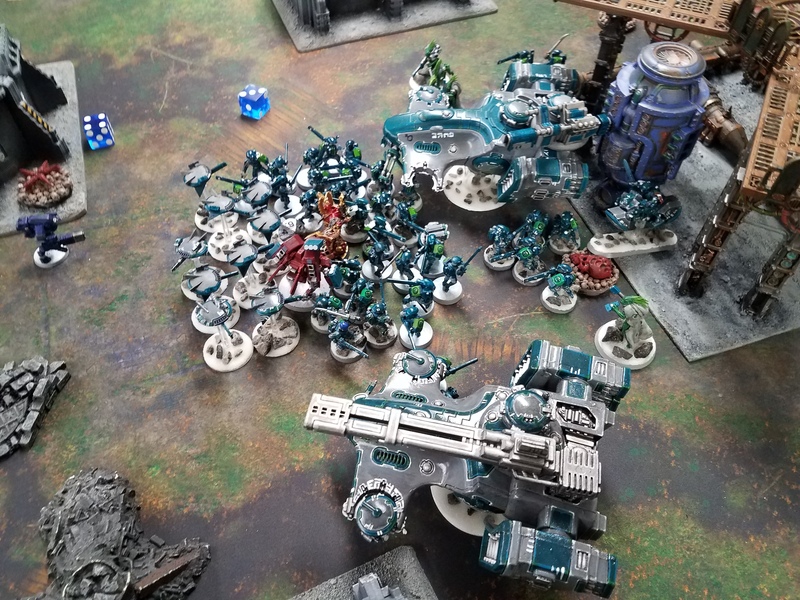 I've broken the battle report into two parts for reason which will become clear in part 2. Everything moves up and a unit of berzerkers and a couple characters get out mid field. The full Kytan tries to go around on my left flank and bypass my blockade in the middle. 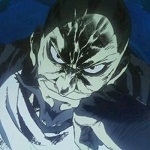 His shooting reduces Longstrike to 3 wounds. My central unit of 10 kroot are wiped out, 2 of the piranhas are also destroyed by shooting and melee. I was right to fear them hitting my lines. 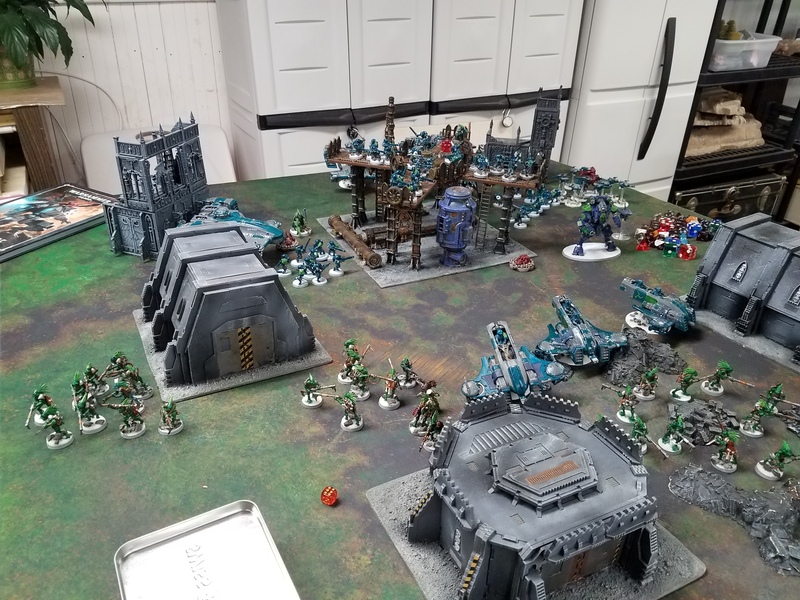 My ghostkeel move up the left flank to block the kytan who was trying to slip along the flank. Kroot on the right flank move to block the right rhino and steal back an objective.My commanders deep strike behind the world eaters with the drones. The cold fusion commanders hops up into range to hit either of the kytans. My plan was to eliminate the full strength one to get the most mileage out of my +1 to wound stratagem. I kill the full strength kytan, jump lord and the berzerker squad that got out. Then I assaulted his character with the kroot, his rhino carrying kharn and a unit of berzerkers with kroot and the piranha. 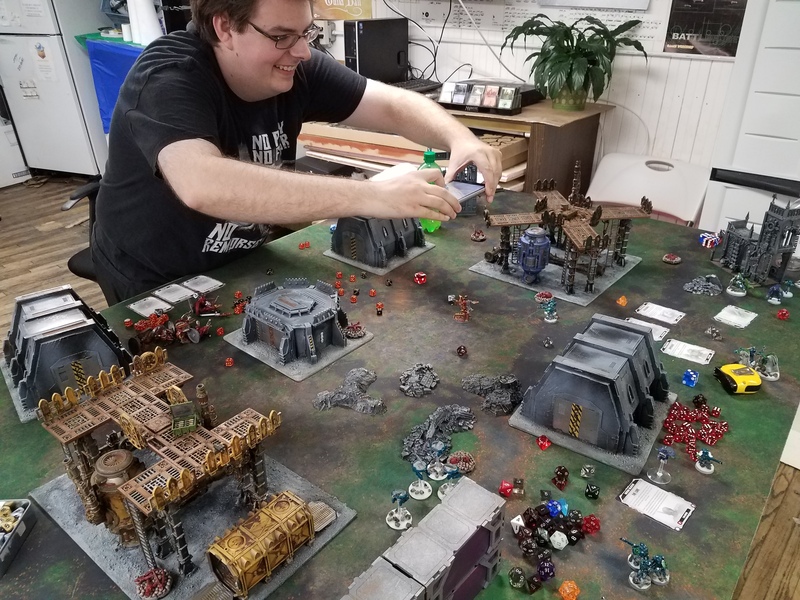 The remaining Kytand moves up to the lines with the rhino, Kharn gets out to kill enough kroot so that they fail a morale check by his hand for priority orders recieved. 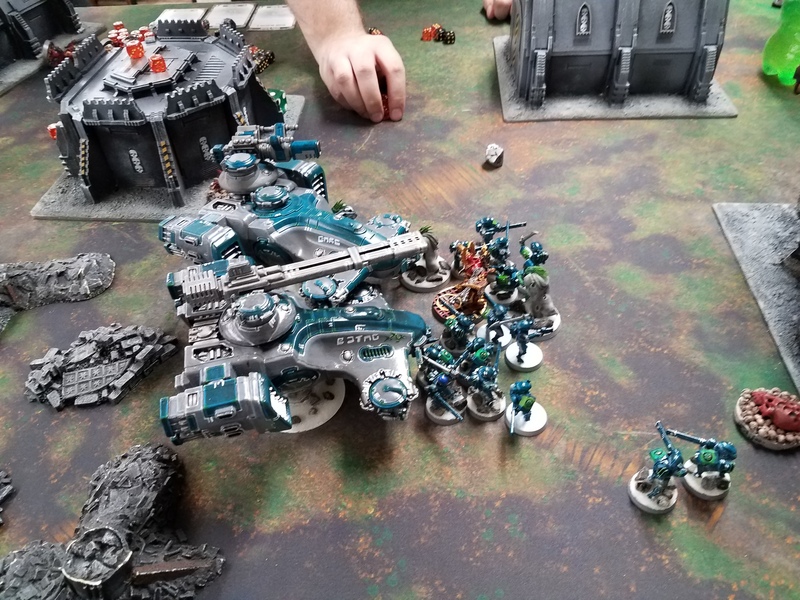 The berzerkers on my left flank get out of their rhino and head towards the ghost keel. The Kytan kills longstrike in with shooting and assaults the skyray but does not kill it. 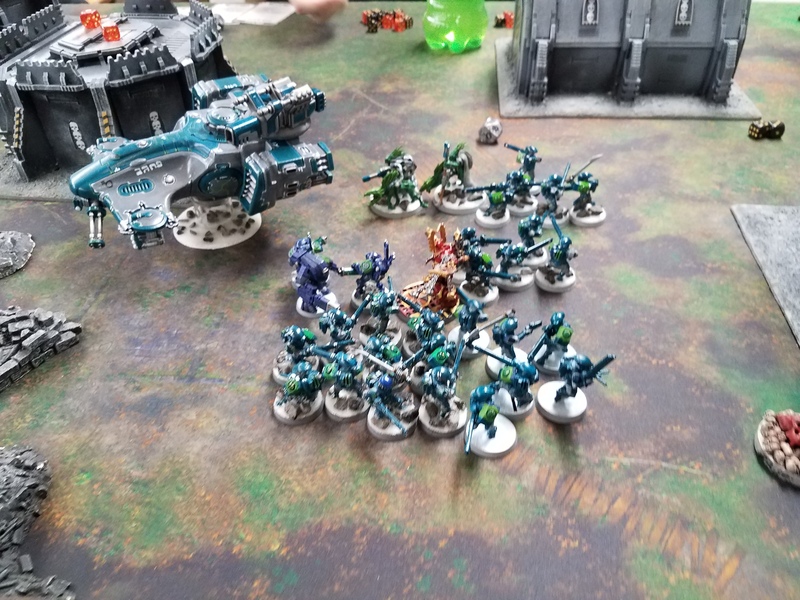 The ghostkeel and the kroot die in melee. A rhino assaults a unit of fire warriors. Kharn reembarks on the rhino. The cold star commanders move to kill a couple characters in the middle in melee but in my zeal to drop them to 1 wound I kill them. 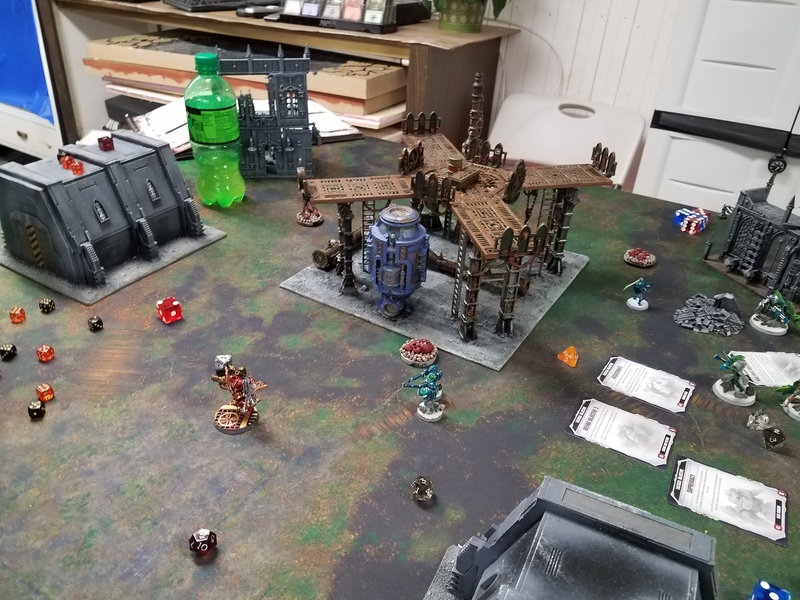 Kytan gets killed by a plucky fire warrior with an emp grenade. Berzerker squad on my left flank dies to shooting. I had priority order to kill a unit with my fireblade so a comical amount into them but I got it lol. I assault a bunch of fire warriors into the rhino close to my lines. The last berzerker squad gets out of their rhino. 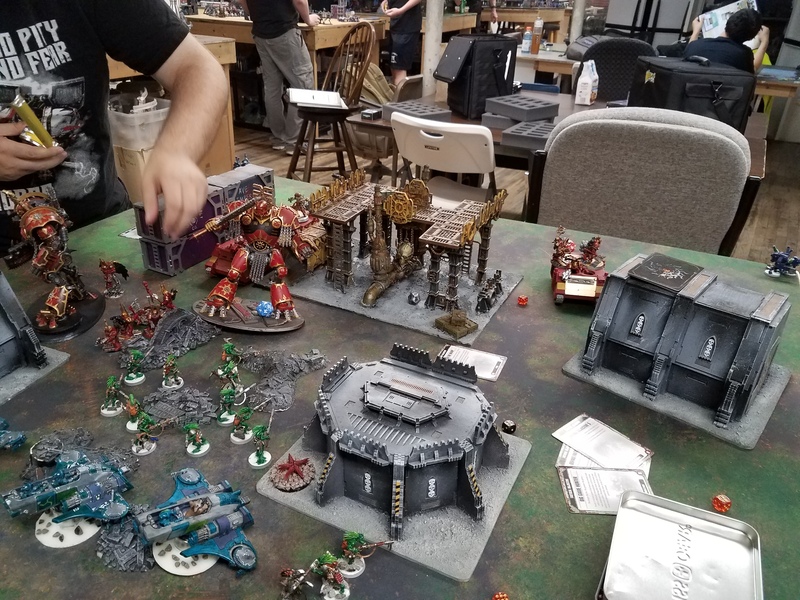 Kharn and a buddy make a beeline for my cold star commanders and the berzerker squad goes after the drones and the stealth suits. The stealth suits live and the commanders die to Kharn. 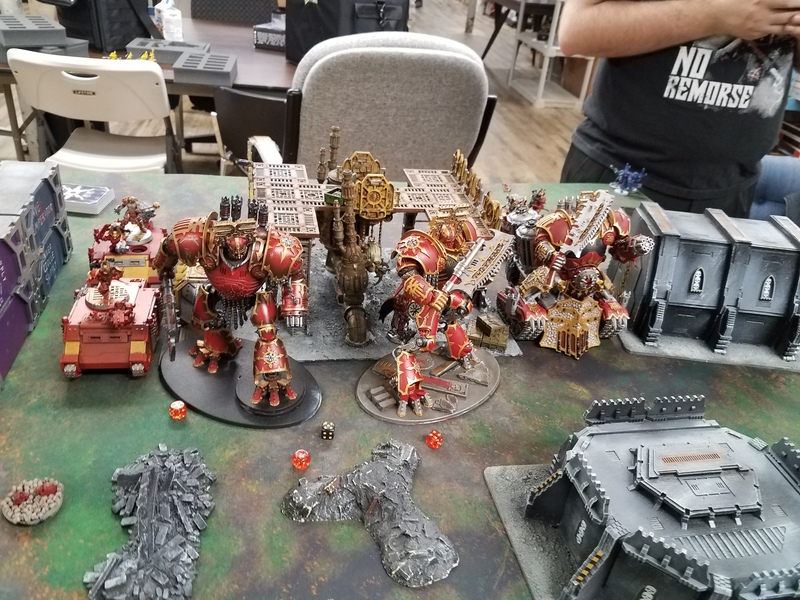 At this point Spencer mentions that he is bummed he didn't have a command point to buff up Kharn from killing a character. I tell him then that I will spend my command points just to buff up Kharn for him and I won't shoot Kharn anymore. 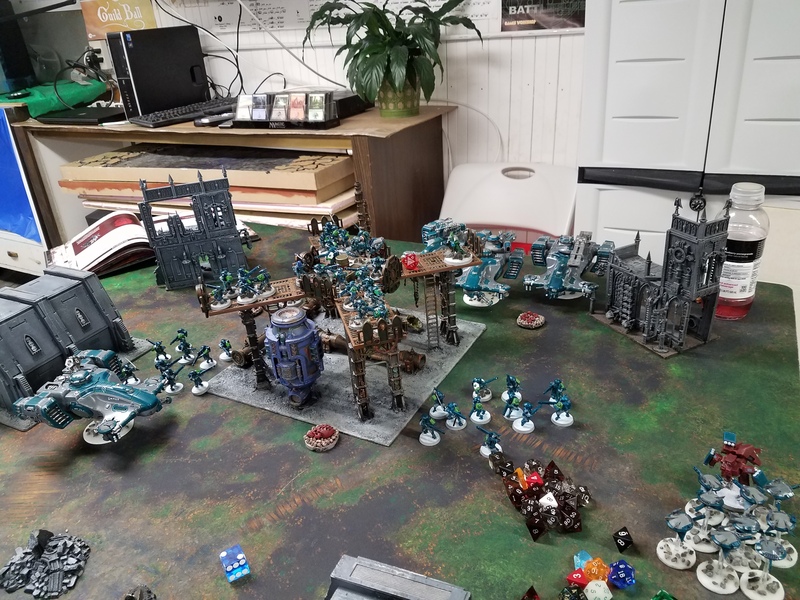 So the hilarity of 2000 points of Tau vs 1 Kharn in melee began. The game went to 7 turns. 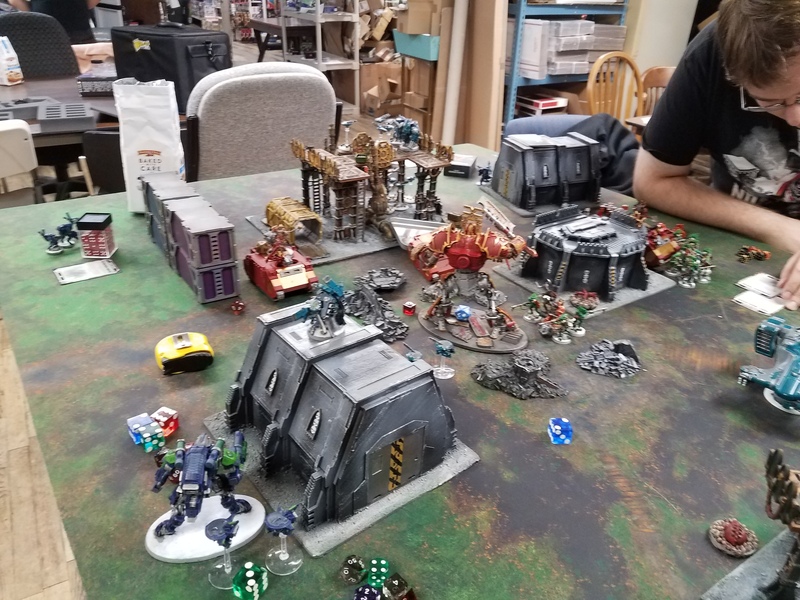 my turn 4 I destroyed every other model besides Kharn in shooting. The game was a lot of fun I really enjoyed it. I ended up getting lucky with my shooting T1 and in getting the first turn. 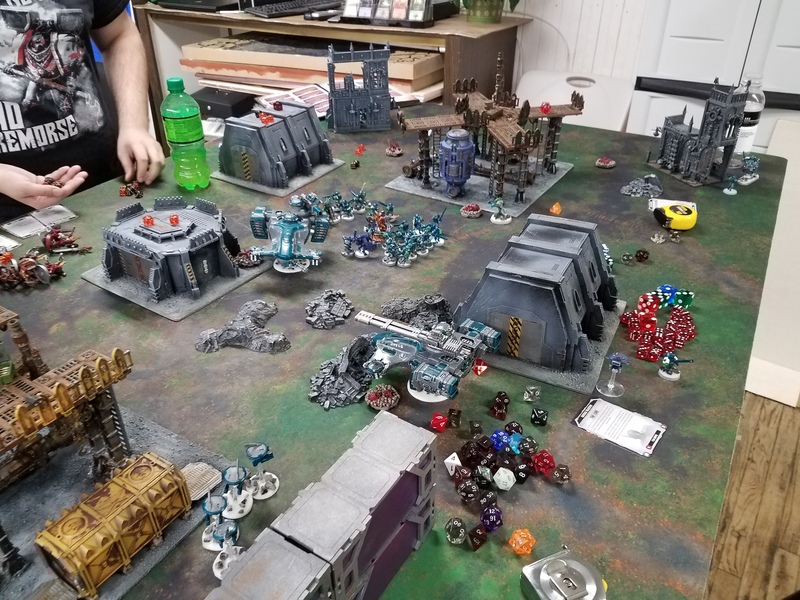 So while it was turning into a route trying to hit all the ridiculous objectives and trying to kill Kharn in melee made it for a very fun game that was decided by the last dice roll. There was a lot of anticipation on both sides to see the result of the explosion. So a quick edit. Kharn's warlord trait is +1 S and A for each character killed. His final stats were S15 Base (+1 with gorechild), 18 attacks T5 2+/3++, -1 for enemies to hit against, 6W.